science « Midlife Crisis Crossover! For now, that’s all we have. Collaborations between the Nolan brothers have yet to create dreadful results. Their track record tells us it won’t be a straightforward ninety-minute shoot-’em-up. Based on the precedents set by Nolan and Nolan’s innovative narrative explorations of dreams, memory, anarchy, class warfare, and Robin Williams’ serious side, I expect a time travel tale crafted under their watch to be a mind-bending reexamination of that sci-fi subgenre in a way we didn’t already see in Back to the Future, Bill and Ted’s Excellent Adventure, the various conflicting Terminator products, and several hundred Star Trek episodes. If the Nolans plan to incorporate the work of a real physicist into the script instead of borrowing from other time-travel films (which is typically how those films are made), you can bet that at some point half the audience will be lost, no matter how hard they concentrate, no matter how many pages of grad-school textbook exposition are seamlessly woven into the dialogue. As we saw in our previous installment, the Kansas Cosmosphere and Space Museum in Hutchinson, Kansas, provides a good, safe home to many retired spacecraft and spacecraft understudies. Their collections are a comprehensive tribute to those pioneers and daredevils who yearn to see mankind reach beyond our spatial boundaries and discover what else lies in store for us in God’s universe. When the crew of the Apollo 11 flew their previously voyage to the moon and took those fateful first steps on the Moon on behalf of all humankind, Neil Armstrong was 39, Buzz Aldrin was three weeks short of 39, and Michael Collins was three months short of 39. When I was 39, I took my first step in Manhattan. They win. It should go without saying how easy it is to be impressed and intimidated by the monumental nature of such an accomplishment, and at what seems like such an early age, all things considered. It’s no surprise that all other Internet news was therefore benched and ignored today when word was received that Neil Armstrong just passed away at age 82. Over the years, our family has encountered a smattering of examples of what Armstrong and other astronauts made possible, particularly the vehicles and tools they used to break all those barriers and dare the impossible. The Rocket Garden at Kennedy Space Center, Florida, 2007. Some were unmanned; some very much weren’t. If the moon landing hadn’t happened, I imagine much of the later flights would’ve looked very different, if America had bothered with them at all in that depressing, isolationist alt-timeline. 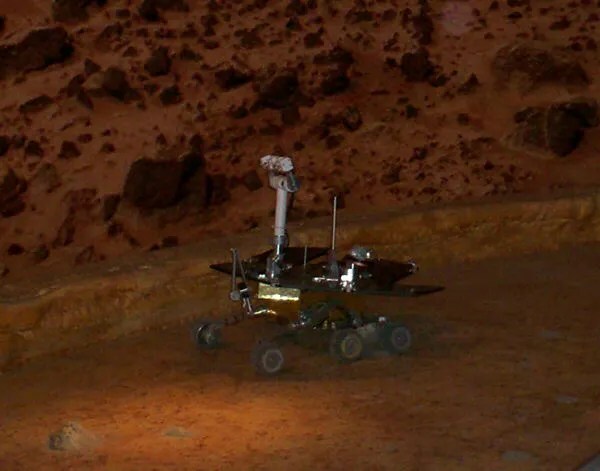 In 2009, the Field Museum of Natural History offered us the chance to remote-control this li’l simulated Mars Rover. If Armstrong and His Amazing Friends hadn’t reached the Moon, it’s safe to say landing anything on the surface of Mars would’ve remained a science fiction pipe dream, and Curiosity would have never existed (to say nothing of the effect on curiosity with a lowercase ‘c’). 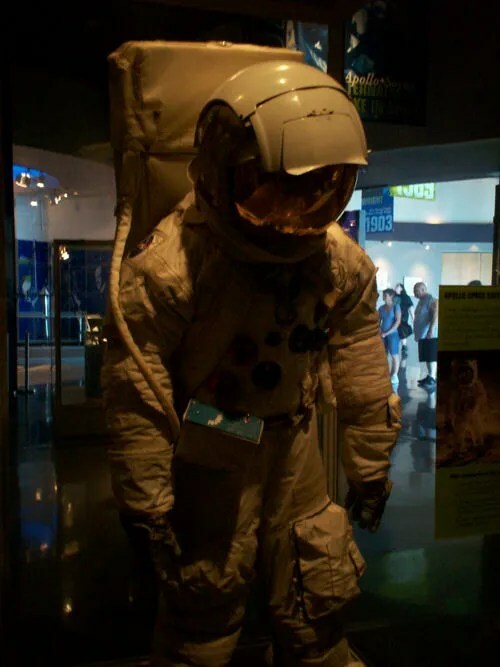 At first I thought about truncating this entry and centering solely on this image of an Apollo spacesuit (also from KSC, 2007), which seems more solemn than any astronaut ever ought to be. 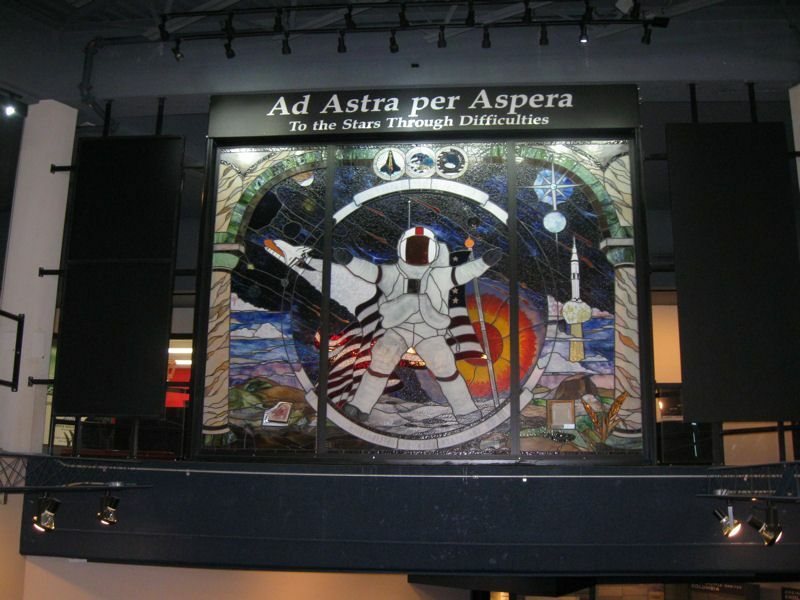 On second thought, I decided I prefer this heads-held-high tribute from the Kansas Cosmosphere, June 2012 — a fitting expression of admiration for those great deeds, emboldened by the hopes that someday they’ll inspire and be followed by deeds even greater. May God bless you and keep you, Mr. Armstrong. Our itinerary for Day Three continued from the Red Rocks Amphitheatre to nearby Dinosaur Ridge, less than a mile down the road as the crow flies. We’ve seen dinosaur fossils before at the Children’s Museum in Indianapolis, as well as the Natural History Museums in Manhattan, Chicago, and Washington, DC. Truth be known, simple fossil exhibits aren’t as exotic to me now as they were in my youth. 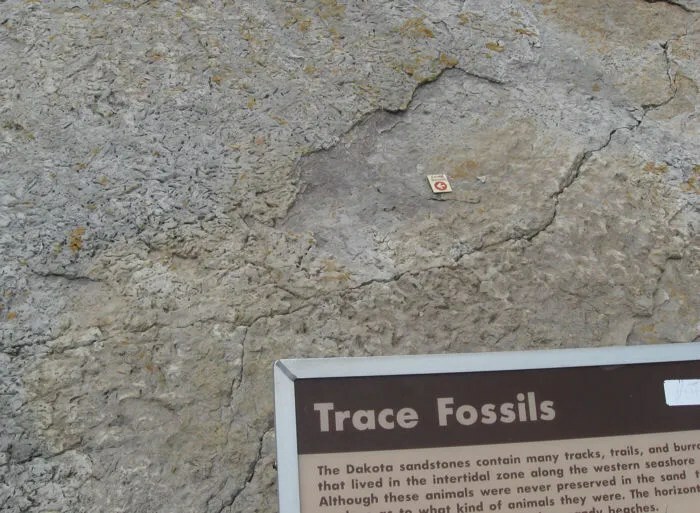 The displays at Dinosaur Ridge offer a different take on the subject — their fossils and samples are outdoors and still embedded in solid rock, exposed ever so slightly for visitors to see them in their natural habitat instead of being reassembled on a dais or sealed inside a glass cabinet. 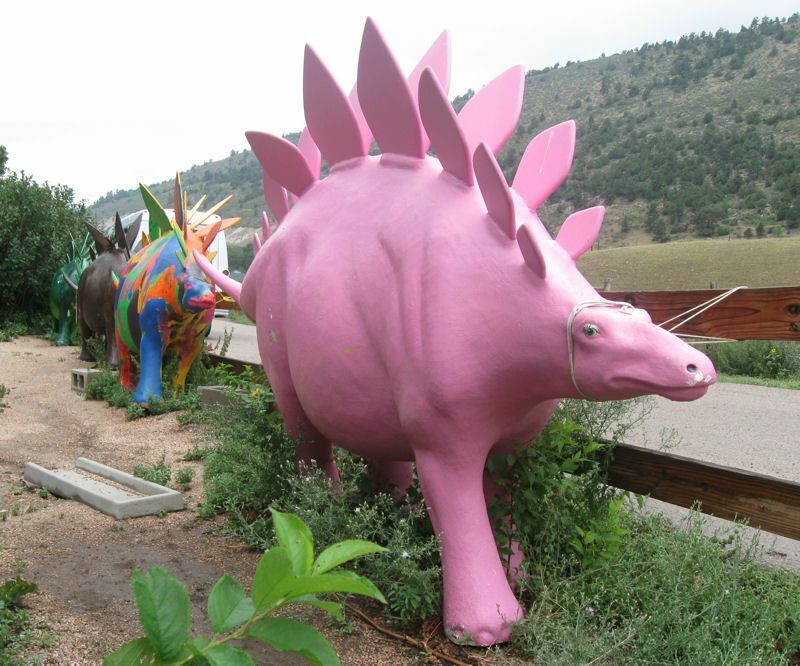 When I first learned of the Dinosaur Ridge premise, I imagined entire walls filled with a panoply of complete, recognizable skeletons. That’s not quite the reality. The entrance and welcome center set the stage just like any standard museum, with the prerequisite dinosaur statues and shelves of dinosaur toys. For an added flourish, off to one side is a stegosaurus pride parade. The natural exhibits comprise the wall along a curvy, uphill mile of Alameda Parkway heading west from the visitor center. No cars are allowed up the ridge except the official Dinosaur Ridge shuttles. The shuttle ride is free, as is their tour guide who elaborates on any points of interest and keeps you focused on the marvels you’d hoped to witness. 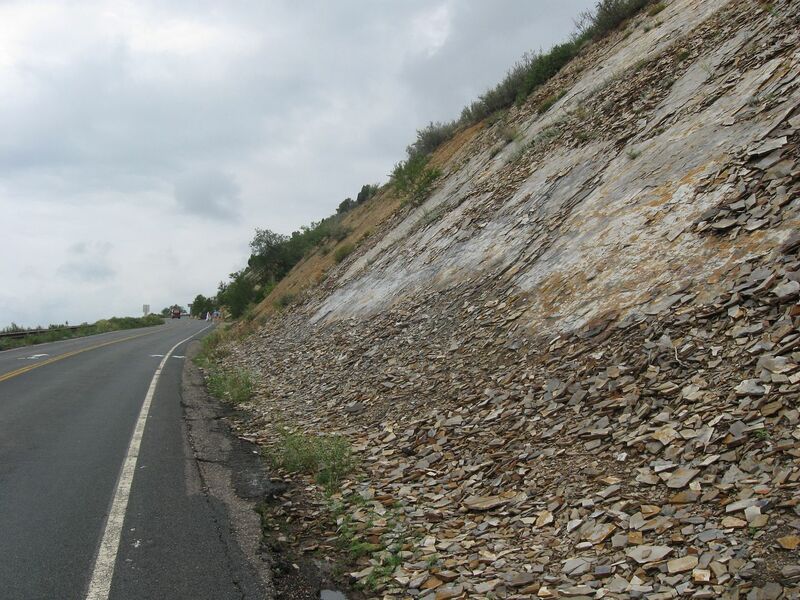 If you’d prefer to chart your own destiny, pedestrians and bicyclists are permitted to traverse the ridge as they see fit. Our family policy is we prefer to set our own pace and avoid trapping ourselves in other tourists’ schedules or paces. In some situations this can be advantageous if you know what you’re doing and have all the same exhibit access that the tour groups do. 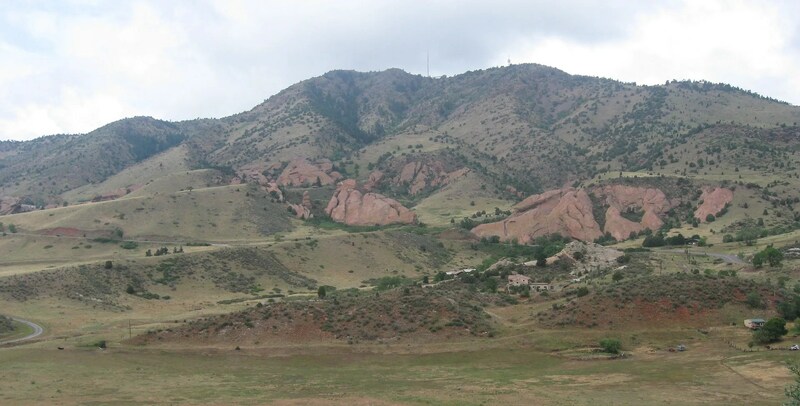 In this situation, it meant a stubborn one-mile walk uphill, which mostly looked like this. Open highway plains to the left of us, rough terrain to the right. Every several hundred feet, we’d arrive at something of note. 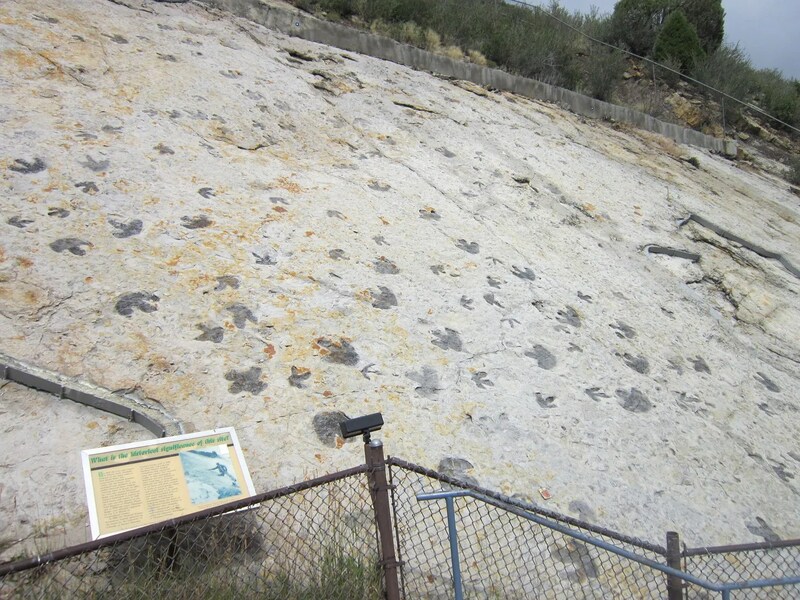 This collection of preserved footprints wins Best of Show, Dinosaur Ridge Exhibit category. If your child thinks ancient plants are as cool as dinosaurs, this selection of imprints may make an interesting poster. Most of the long walk was decorated with naught save rocks, stones, pebbles, boulders, and suffering grass. 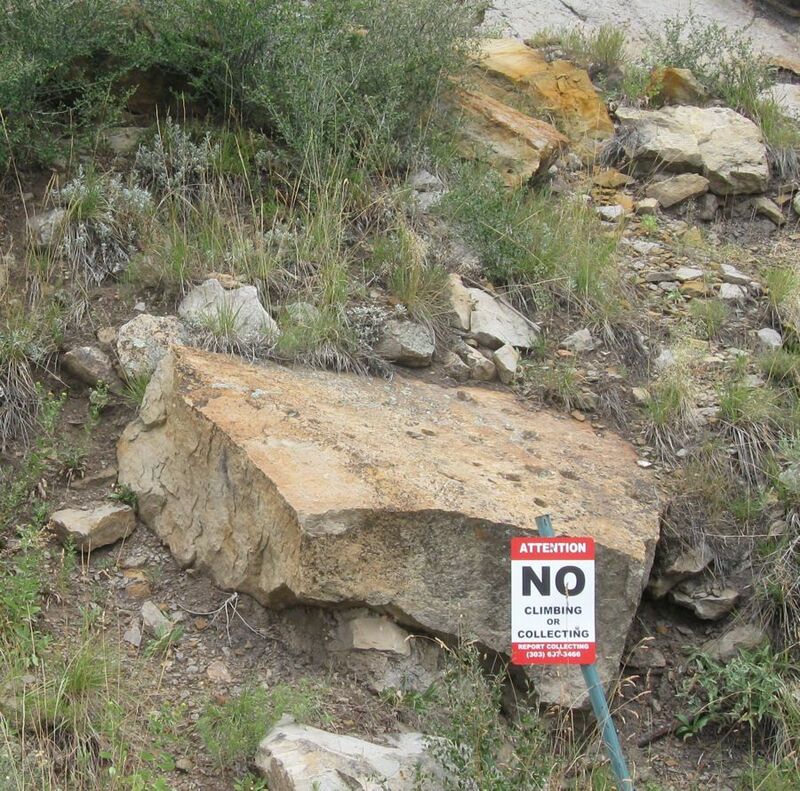 In a few spots, helpful signs invited more specific attention to traces that are scientifically noteworthy, easily overlooked, and nearly invisible to the untrained eye. Closer inspection could reveal greater detail, or stump the more impatient onlookers. Thinking about chiseling your own souvenirs out of the walls? Think again! Guests are strongly encouraged to tattletale on other guests. 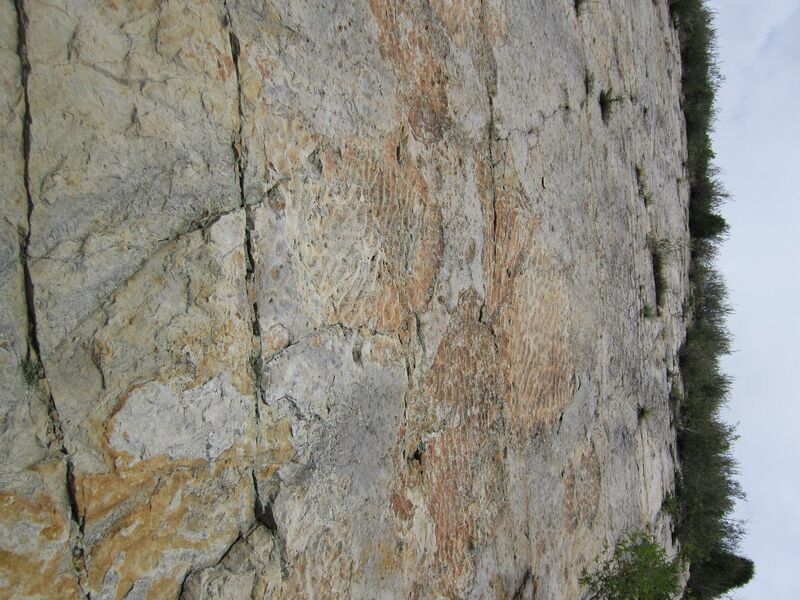 Big Paleontology is Watching You. 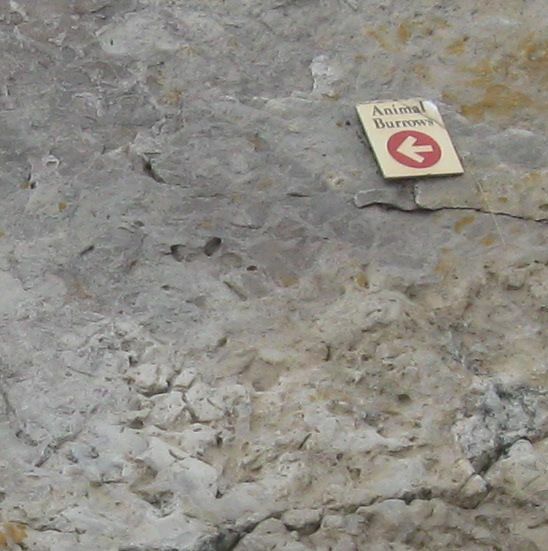 Amateur geology is ungood. We have always been at war with Eastdakota. If you survive your one-mile uphill calisthenics, congratulations! Your reward is a breathtaking sight of other Rocky Mountains in your area. If you’re a seasoned hiker (which describes none of us), this was a cakewalk. If you’re my wife and you’re still acclimatizing to the thinner air at this elevation, a nearby bench offers a broad landscape view and a moment to reflect on your husband’s boneheaded decision to skip the shuttle. The return trip downhill was thankfully easier and faster. The rematerializing storm clouds that dogged our heels certainly encouraged a brisker pace and inspired us to catch our second wind. By the time we reconvened at the car, the threat of downpour subsided and it was still only 11:30 a.m. MDT. Our long day in the Rockies was far from over. As you can imagine, walking requirements were negotiated down to a bare minimum at subsequent stops. “Fight for Space” Documentary to Ask: Whatever Happened to the Final Frontier? At the Kansas Cosmosphere and Space Center in Hutchinson, KS, this sign looms over you as you descend the steps into the main exhibit hall in their basement, where rests a comprehensive collection of rockets, spaceships, and aeronautical paraphernalia from various countries that share an active or tangential history with space travel. Man’s quest for space has been fraught with skepticism, debate, setbacks, and major disasters. “Difficulties” is an understatement. That basement location is an apt metaphor for the state of American spaceflight today, compared to other agendas and priorities that garner larger headlines and weigh on us more heavily in the moment. What once seemed like a top-shelf objective for purposes of scientific research and frontier exploration is now a set of mostly forgotten toys boxed up and forgotten in some dark corner. A few weird kids still cherish them and try to make the most of them, but no one else is interested in watching them play or buying them better toys. The Cosmosphere has one small section dedicated to the current state of space travel aspiration, including photos of several independent companies and programs (not just American) dedicated to continuing the work that NASA started but now seems too crippled to pursue alone. I had passing familiarity with Virgin Galactic and SpaceX before we visited the Cosmosphere on this year’s road trip, but I was surprised to see that several other would-be pioneers have tossed their hat into the ring to see what they can make happen. I’m not surprised at my relative lack of awareness. I first learned about the 2010 mothballing of the Space Shuttle program from a 2009 exhibit at Chicago’s Field Museum. I couldn’t believe that such a declaration of retreat hadn’t somehow caught my attention before. A tiny shuttle diorama had to break the news to me. When events and successes occur in or about space, they tend to be reported in the back section of your few remaining local newspapers (the same section containing “news” such as “College Study Shows Eating Causes Fat”), or in an easily overlooked article link buried among two dozen other such links in the “Stories with Ten Hits or Less” section of your favorite news site. If we’re not actively hunting for space news, our odds of keeping tabs on it by casual happenstance are nil. Filmmaker Paul Hildebrandt is working on a new feature-length documentary called Fight for Space that aims to update us all on just what happened to the space race, where it is now, who does or doesn’t care, and why America’s support for it has all but withered away. Hildebrandt and his crew have already conducted numerous interviews with scientists and non-scientists alike, with plans and hopes to keep adding more diverse viewpoints to the mix that would push the movie even closer to fairness and balance. To that end, Hildebrandt launched his Fight for Space Kickstarter campaign last week to fund his efforts beyond the initial investments. At their current rate of acceleration the project should be fully funded by Monday, so a desperate call to arms and wheedling for more money is hardly necessary. Regardless, pledges are still accepted, the reward packages are generous, and I’m curious to see if extra support would make the movie even snazzier. The Kickstarter page has a short video with excerpts from some of the interviewees already in the can — the likes of Neil Degrasse Tyson, the inimitable Bill Nye the Science Guy, Star Trek: Voyager‘s Robert Picardo, and several studious-looking science guys that some of you probably know and love. (I wasn’t kidding about my ignorance.) The same page also informs us of PBS’ officially piqued interest; shows us a 2013 US government budget projection that would provide NASA with just enough lunch money for half its staff; and links to an hour-long speech from Tyson, who I’m told may be the coolest astrophysicist of all time. I’m not sure I foresee the Fight for Space campaign becoming another Order of the Stick, but I look forward to seeing this movie, and I wouldn’t mind if they had the chance and the resources to make it even bigger and better. At the very least, maybe they can use the extra petty cash to buy NASA the largest Christmas turkey in the shopkeeper’s window.